This title is not awesome because it’s a silly pun. 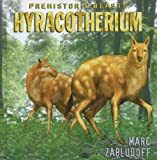 It’s because there’s actually such a creature as a hyracotherium! Say that five times fast. Then type it five times fast. 🙂 Are two hyracotheriums called hyracotheria? Might have to read the book to find out! Even the author name is pretty cool on this one. For the curious, he’s a link to the hyracotherium Wikipedia page.